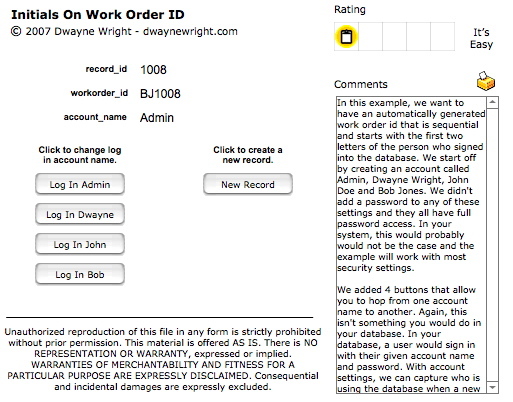 In this example, we want to have an automatically generated work order id that is sequential and starts with the first two letters of the person who signed into the database. We started off by creating security accounts called Admin, Dwayne Wright, John Doe and Bob Jones. It is very easy to setup and manage FileMaker Accounts and Privileges. You can even edit these settings on a LIVE shared database. Accounts are given a level of security by defining a privilege set to it. The account settings will be applied to all the tables with a file. We didn't add a password to any of these settings and they all have full password access. In your system, this would probably would not be the case and the example will work with most security settings. We added 4 buttons that allow you to hop from one account name to another. Again, this isn't something you would do in your database. In your database, a user would sign in with their given account name and password. With account settings, we can capture who is using the database when a new record is created. FYI ... You can totally administer accounts via ScriptMaker. In fact, there is an entire family of script steps called ... you guessed it ... the Account script steps. Using scripts, you can help make the account management tasks much easier than a totally manual process. We created a record ID field that is sequential via that auto enter field option. We then created a work order id field that is also auto enter. What it automatically enters is the first letter of the account first name, the first letter of the account last name and the record id. So when Bob Jones creates a new record, it may look something like BJ1004. So I'm saying give me the 1st left character of the first word in the account name ... then add to it ... the 1st left character of the last word ... then add to it my record id data. So to test this out, click any of the account buttons and then click the New Record button.